People Before Profit are a green socialist party, and we recognise that Ireland’s public transport infrastructure needs to be expanded with urgency if Ireland is to tackle climate change. We need greener transport solutions – and we need Cork to become less reliant on car travel. In the “Ireland 2040” plan, released in February 2018, a feasibility study was announced for a Cork Light Rail system between Mahon and Ballincollig. It is likely that Ireland’s right-wing parties will use this feasibility study to shoot down the prospect of light rail on economic grounds. Watch our video from August 2018 where we outline our vision of a Cork with light rail and better suburban rail connections. We say that it is crucial, if Cork is to develop sustainably, and if Ireland is to reduce carbon emissions, that light rail is implemented in Ireland’s regional cities as a priority. People Before Profit Cork is calling on all local authorities to start this process as a matter of urgency. 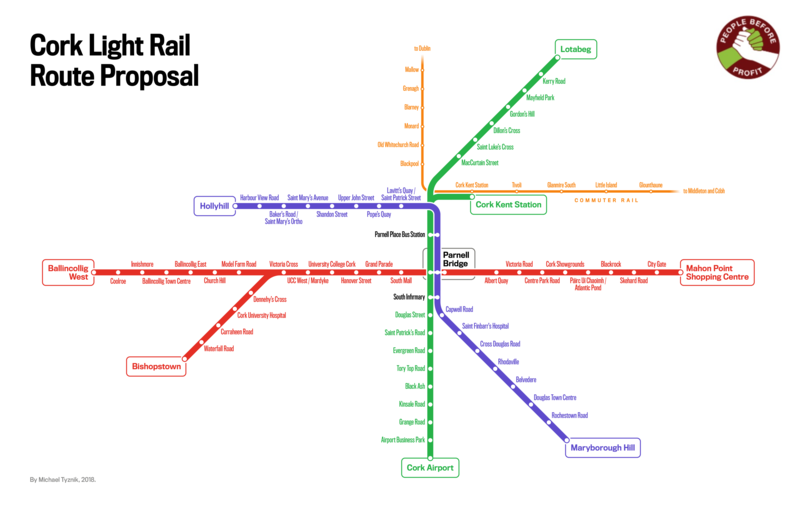 People Before Profit propose that as well as developing a Mahon to Ballincollig/Bishopstown light rail connection as suggested, a second line is constructed connecting Cork’s northside and Kent Railway Station to Cork Airport, and a third between Douglas and Holyhill. All lines could intersect at Parnell Place. Interconnectivity between different modes of transport is essential if public transport solutions are going to succeed in getting cars off the road. The images below show an outline proposal for a 38km light rail system in Cork which People Before Profit would like to see developed further. These routes would provide connectivity to a number of residential areas, employment areas, transport hubs and public services. The proposed layout allows for future expansion to outer suburbs such as Carrigaline, Rochestown and Ovens. The decision to implement Light Rail in Cork should be made based on human need and with a view to tackling climate change. All routes would of course involve certain engineering/architectural challenges, service diversions, traffic reconfigurations and Compulsory Purchase Orders (CPOs) of land in certain areas. From Mahon Point shopping centre the route would follow the existing R852 roadway before joining the alignment of the former Cork – Passage West railway line. This is currently a walking/cycle path which could be widened to allow for the retention of the walking/cycling path while allowing for a light rail route to be constructed in the cutting. The route would then travel along the Lee at the Marina, passing Pairc Ui Chaoimh and passing through the docklands which are earmarked for significant regeneration. In the City Centre, the route would pass City Hall, South Mall, and Grand Parade, before heading westwards past the Mardyke, UCC and County Hall. From here the route would run parallel to the Carrigrohane Straight at speed, cutting journey times, and then travel on a dedicated alignment to the Model Farm Road (stopping near CIT), and staying off road before joining the R608 through Ballincollig to the western end of the town. This would require structural upgrades to the Skehard Road Overpass as well as widening of the existing cutting through the Blackrock/Mahon area to allow for the preservation of the existing walk/cycle path. The route would travel to the recently opened southern entrance of Kent Station, along Penrose Wharf to the bus station, intersecting with Line 1 on Parnell Place. The route would then stay on-street until the Kinsale Road Roundabout, passing through Turner’s Cross along the Kinsale Road. The route would pass under the Kinsale Road Roundabout and travel on a dedicated alignment to Grange Road, prior to travelling on a dedicated alignment to Cork Airport, serving Cork Business Park. A steep gradient would need to be negotiated from the Kinsale Road roundabout to Grange. This alignment for example would require two new structures. A new bridge to bring the light rail system over the Kinsale Road Roundabout and to a higher elevation starting the climb to the Grange and the airport, and a second structure across the N27. The route would travel between the south-east and north-west suburbs of Cork, connecting the large Douglas area with employment and residential areas at the north-west area of Holyhill. The route would share alignment with Line 2 through the city centre and would be built almost completely along existing roads. No major road crossing structures would be required and gradients would in places be steep but possible. Until 1931 Cork had a tram system connecting the city centre with the towns of Douglas, Blackrock, Tivoli and Sunday’s Well. These routes, as well as numerous railway lines and stations in Cork were also closed during the 1900s to make way for private cars. Today, transport in Cork City is largely dependent on car journeys. The city centre and suburbs suffer regularly from heavy congestion. 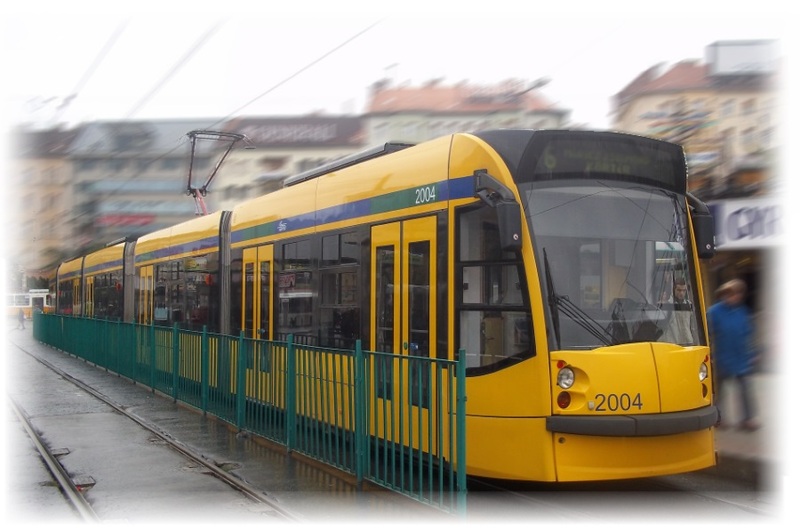 Many European cities of a similar size benefit from light rail systems, removing many cars from the city centre and providing fast and efficient connectivity between commercial and residential areas. The Cork city and suburbs area has grown by over 10,000 people in five years and significant future growth is predicted. Redevelopment is proposed in a number of areas in and around Cork, including Cork’s southern docklands and Tivoli. With the expansion of the Cork City boundary imminent, it is crucial that the development of the expanded city is centered around sustainable transport. A 2017 publication by Transport Infrastructure Ireland has shown that many National Roads around Cork are currently operating above their design capacity. In order to move towards a green future, radical changes will be required in the way that public transport is provided. Given the success of light rail in Dublin, similar schemes should be implemented in Ireland’s regional cities. There are more than enough financial resources in Ireland to deliver such systems. Successive governments have lacked the political will to develop and maintain green and sustainable public transport infrastructure. We need solutions like this to provide alternatives to car transport. Below is an interactive map of a draft proposal of a network we would like to see explored further, which would provide better connectivity for key areas of Cork City.